If you think managed print services are just another unnecessary and extra expense for your business, you’ll be pleased to know that it’s just the opposite. You’ll be surprised by what managed print services can do for your employees and your business, regardless of the industry or line of work. Before we dive in, we want to make sure you have a great understanding of what managed print services are when it comes to your office technology and your workplace efficiency. Managed Print Services (MPS) is the creation of a plan for the printing of a business’ documents. It typically begins with an assessment to identify all office equipment that prints, such as copiers, printers, MFPs, and fax machines. Once the assessment is complete, a plan is developed by your MPS provider to maximize efficiencies. This plan also helps reduce the amount of downtime your company might currently face because of print infrastructure issues or insufficiencies. Any business should utilize a managed print assessment, especially if your business is growing. Print management should be reviewed regularly since it can dramatically reduce costs, create a more secure environment, and improve on common printing methods. Do you sill need more of an explanation on managed print services? 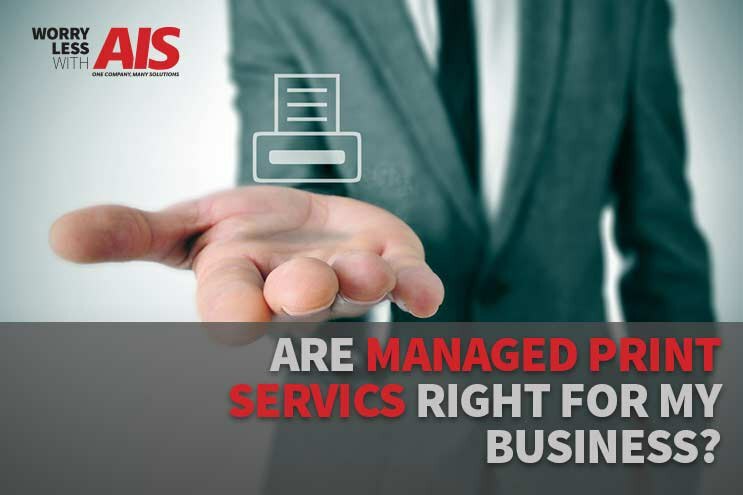 Read our article, What Is Managed Print Services? The more you know about your company, the better the growth you’ll see, right? There’s a ton of management services out there for your business, such as marketing or budgeting. Why stop with printing? There’s a lot that a print assessment can recognize and identify, particularly issues that you aren’t even aware of. A managed print assessment helps get the right technology and devices in place. Once this happens, a managed print services provider looks at ways to improve the productivity in your document-related workflows. A great managed print services program offers print automation technology that takes workflow automation beyond just scanning. Your workflow data is analyzed by what you’re currently printing, why these documents are being printed, which documents are shared throughout your business and the frequency of these printing jobs. This provides insight and recommendations to help automate and simplify your document workflows. Once your workflow is optimized, an MPS provider will assist you in monitoring your dashboards to ensure your content is being managed efficiently. How secure are your networked devices? How frequently do you check to make sure your business, including printers, is safe from online hackers and cybercriminals? Unfortunately, cybercriminals don’t discriminate when it comes to which business they decide to attack, and when. It’s becoming more and more critical to ensure your printing devices are kept secure, to protect your business and employees. Enhanced authentication: Authentication capabilities give you more visibility and control over document security at every device in your office. Encryption: Encryption is the process of encoding data, making it unintelligible and scrambled. In most cases, encrypted data is also paired with an encryption key, and only those that have authorization to that key can open, view, or use the document. Virus Protection: Virus protection software is designed to prevent viruses, worms and Trojan horses from getting onto a computer as well as remove any malicious software that has already infected a computer. The Telegraph published an article on protecting your network you might want to check out, Five Ways To Secure Your Business From Cyber Attack. Even with all of these incredible security measures available, it’s important you make sure the devices you’re using are capable of supporting safety integration and document security. This is especially critical for large businesses. Talking with your MSP provider about your current office technology and how it can (or cannot) adapt to security features is a great way to get the most out of your print assessment. Partnering with a great managed print services company allows you and your employees to print securely when and where you want. You can do so by using an enabled (and safe) device. To learn more on security integration and protecting your business, read our article, Network Security Issues: 10 Tips To Keep Your Business Secure. When it comes to optimization of your business, the first thing that comes to mind is probably cutting back on expenses or better ways of allocating the money you spend on technology. An understanding of the current total cost of ownership (TCO). TCO is an analysis that places a value on the complete lifecycle of a purchase. This value includes every phase of ownership, such as acquisition, operation, supplies, and training. The evaluation of current operating and printing costs and performance of all devices in your office, as well as the potential savings opportunities. An assessment of your current operations, consumptions, and document output, such as the amount of paper your business is using. The presenting of dynamic solutions specific to your business goals and employees. Analytics that helps inform you and your employees of current processes and how to improve. A review and discussion of the benefits of any newly suggested printing solutions. A great managed print services provider should tailor the data from the print assessment to your individual business needs and goals to ensure the services address your obligations. As you can tell, managed print services are right for just about any business out there. Finding an MPS program that best suits your business might be challenging at first. But, once you partner with the right team, you’ll be amazed by the results. AIS wants the best for you, your business, and all of your employees. The best way to ensure you’re getting the best equipment for your company is by becoming informed. Understanding the needs of your business is a priority. We’re here to educate you with helpful knowledge to help you make great business decisions. To learn more about office technology and services, reach out to one of our business technology consultants, here. We’re here to give you peace of mind, to help you win more business.